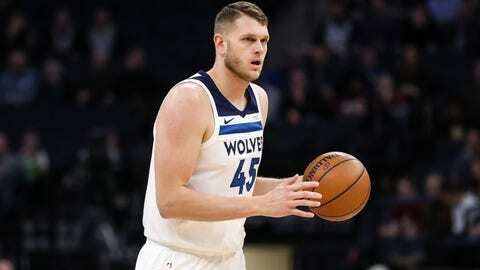 The Minnesota Timberwolves have placed homegrown center Cole Aldrich on waivers, the team announced Saturday. Aldrich, who starred at Bloomington Jefferson in high school, was owed over $6 million for 2018-19, the final season of a three-year deal worth $22 million he signed in 2016. Instead, he’ll account for just over $2 million in dead cap space. The 29-year-old was healthy for most of the 2017-18 season but played in just 21 games, averaging a career-low 0.6 points and 0.7 rebounds in 2.3 minutes per contest. In his two seasons with Minnesota, Aldrich appeared in 83 games and totaled 117 points and 173 rebounds for his home team. Aldrich, who has suited up for six different teams over his eight-year NBA career, will be an unrestricted free agent when the market opens Sunday.